The Celtic evangelist monks referred to themselves as pilgrims for Christ. Their belief was that the spiritual journey of our lives demands both outward and inward wandering, often not knowing where God will lead. With dusty feet and a few companions, these men walked the paths and roads ministering to the poor, establishing monasteries, spreading education, preserving knowledge, and being Christ in this world. They were close to nature because traveling afoot, they saw the land, the sky, the water, and the people. They were well known in the British Isles and in other northern European countries. Born in 634 in the Scottish Borders, Cuthbert became a monk at Melrose in 651. Later he became Prior of Lindisfarne (now also known as Holy Island). He was consecrated Bishop of Lindisfarne in 685, and died in his solitary retreat on Farne Island on March 20, 687. A man of intense prayer, beloved of all with whom he came into contact, and to whom numerous miracles have been attributed, he is the most famous saint north-east England. Many legends tell of his close relationship with the sea birds and otters. In 857 Danish raiders destroyed the monastery at Lindisfarne, forcing the monks to flee and to take with them the body of St. Cuthbert. Finally a century later, in 995, the saint's remains reached their final resting place at Durham Cathedral. 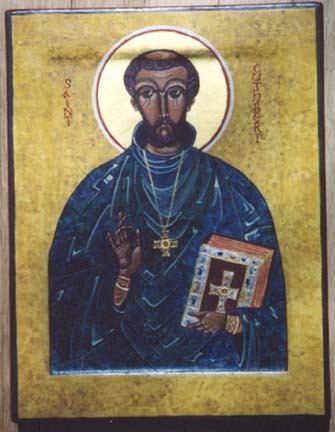 This icon portrays him in monastic robes, wearing his pectoral cross (which is on display in the Durham Cathedral Treasury), and he is holding the book of the Lindesfarne Gospels. Click here to link to the British Museum's tour of the Lindesfarne Gospels. It not only has a page by page "turning of the pages", but explains its creation and mentions St. Cuthbert. Click here to link to The Holy Island of Lindesfarne.